The CoMSEF Executive Committee is pleased to announce that Professor Ed Maginn of the University of Notre Dame has been selected as the recipient of the inaugural CoMSEF Early Career Award. 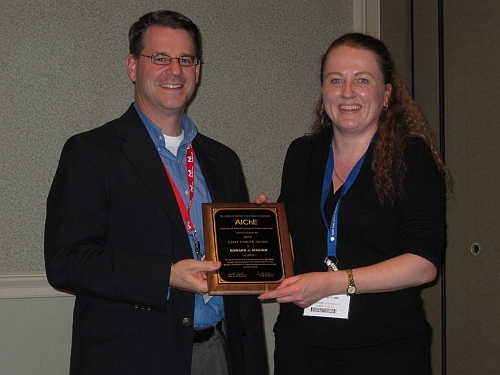 This new annual award recognizes outstanding research in our field and was given to Ed at the start of session 113 - Recent Advances in Molecular Simulation Methods I - at 12:30 PM on Monday November 9 in room Tennessee C of the Gaylord Opryland Hotel during the Annual AIChE meeting. Ed received his B. S. in Chemical Engineering from Iowa State University in 1987. He then worked for Procter and Gamble as an operations engineer for three years before entering the graduate program in Chemical Engineering at the University of California at Berkeley, where he received his PhD in 1995 under the direction of Doros Theodorou and Alex Bell. He joined the faculty of Notre Dame in 1995 and is presently Professor of Chemical and Biomolecular Engineering. 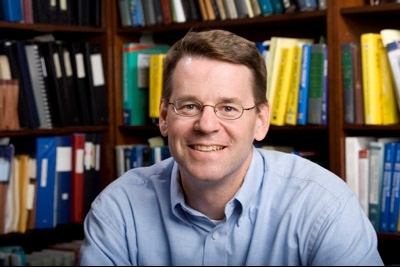 Ed has over 90 refereed publications and two patents and is the recipient of the Dow Outstanding New Faculty Award from the American Society for Engineering Education as well as an CAREER Award from the National Science Foundation. He has also received several teaching awards, including the BP Outstanding Teacher award for the Notre Dame College of Engineering, two John A. Kaneb Awards from the University of Notre Dame and the AIChE Student Chapter Outstanding Teaching Award. Ed is receiving the CoMSEF Early Career Award for his development of molecular simulation algorithms to study fundamental thermodynamics and transport behavior and his specific contributions to the understanding of nanoporous materials and ionic liquids. 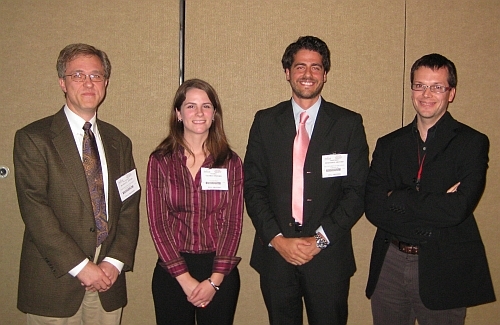 CoMSEF Early Career Award recipients must be in the early stages of their professional careers (in academia, industry, or a national laboratory), defined as being within 15 years of completion of the highest degree and be current members of CoMSEF. This is the Seventeenth Symposium of the well-established series of conferences on thermophysical properties. The Symposium is concerned with theoretical, experimental, simulation, and applied aspects of the thermophysical properties of gases, liquids, and solids, including biological systems and will be held June 21 - 26th 2009 in Boulder, Colorado. This was the second year that CoMSEF has made awards to recognize excellence in research by graduate students in the field of molecular science and engineering. The two awardees were selected based on a nomination letter and a poster presentation at the November AIChE meeting in Salt Lake City. It's time to elect 2 new Liaison Directors for the CoMSEF executive committee. This election will fill the positions of Sanat Mohanty and Ken Cox who have completed their terms. Thanks to previous officers whose terms have concluded. A full listing of the current CoMSEF executive committee is available here.